Les endroits où vous irez. The places you will go. With a brand new year comes a brand new list of adventures. Bucket listing seems to be the thing these days. With Spring around the corner, there is this eagerness to press the “reset” button and start that bucket list. We managed to cross off the “redo the kitchen” from our list. It seemed like there were a lot of hurdles to overcome, and having no access to running water made us more determined to carefully think through our construction process and timeline to get a functioning Parisian kitchen. Nothing says Ooh, la, la, better than navy cabinets with modern brushed gold pulls and a large dose of white slab marble backsplash. I posted the before-and-after photos on our La Cuisine blog. Any pastry chef who accompanies us on a weekend getaway will be tempted to whip up the words bon appétit’. Not only have we been hard at work giving this tired cabin a new lease on life, but we have also managed to pause and smell the mountain air and travel the beaten path. At This Side of Paris, we’ve discovered local gems in the area that we thought to be the perfect way to enhance your experience next time you find yourself here in the High Country. Although there is a lot to get done this year from our bucket list of renovation projects, we are privileged to be able to work among the beautiful surrounding areas of the North Carolina Appalachians. We want the essence of 2019 to be celebrated all year long here at TSOP! 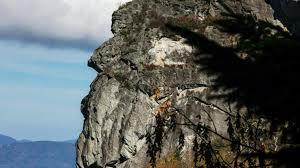 The places you will go in Boone, Banner Elk, Blowing Rock will carve a memorable profile as profound as Grandfather Mountain. A scenic drive on the Blue Ridge Parkway never fails to make the elements of your experience shine brighter than Gustave Eiffel’s tower. Whether you are traveling as a family, exploring as a single, or adventuring as a couple, exploring this side of Western North Carolina will leave you with beautiful lasting memories. Whether it be the enchanting atmosphere of Vidalia Restaurant, or gazing the twinkling stars at night on Grandfather Mountain, it is our desire that the places you will go this year are of some of the sweetest experiences yet! if the natural elements surrounding the property at TSOP don’t sweep you off your feet, then perhaps Sky Valley Zip Tours will whisk you away with fleeting zip lines that will take you on the ride of your life! They offer all kinds of adventures ranging from single riders to tours for the whole family. This year we are ready to let go of the old that no longer serves us joy, and welcome with open arms the new that comes with the year; what better way to “let go” of the old and ride through 2019 than 140 acres of canopy tour fun? If being up in the air is not your style, then you may enjoy staying down to earth, and letting your inner Daniel Boone guide you down the paths of Grandfather Mountain for some modern day pioneering. Don’t feel bad if you end up doing more exploration at the King Street Creamery than on the trails. Finding the right outfit to wear while traveling in style should not be a guessing game. We have put together a collection from our House of Fashion to inspire you. If complete solitude from the world makes you want to travel solo, these places will keep you company. For the two peas in a pod travelers, these places will keep you tethered. For those that travel in a pack, there is a place for everyone. Regardless of where 2019 goes, make sure that the places you will go are the ones that will make you say….. la joie de vivre. We like to think that the joy of living is a handpicked panel of places and activities that reveal the rustic glam essence of This Side of Paris throughout Boone, NC - each in their own unique way.